I have used this book for three of my kids. I keep going back to it, even though I don't like geometry mixed in with algebra. I understand the reasoning. It prepares you for those college entrance exams, but I rather focus only on algebra at this stage. 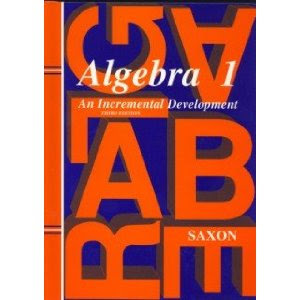 With my last son/student we used this text one year and then used a Geometry text the following year. Practice makes perfect with algebra and I think it helps kids do a number of similar math problems. This way they get it down. Saxon is good at reinforcing previous problems by having a few in each new lesson. Sometimes we could use a few more. The solutions manual is excellent and shows step by step problem solving. Tests are frequent, after every 5th lesson. And each lesson has examples to look at and follow before getting down to doing your own. It is straight forward. There are 30 problems to do each lesson. If you skip the geometry ones, which are usually the last two, then you have 28. Now there seems to be another choice: Saxon Algebra 4th Edition and a separate Saxon Geometry Book. These are the 4th Edition books and are available as well as the 3rd Edition one that I have been using. 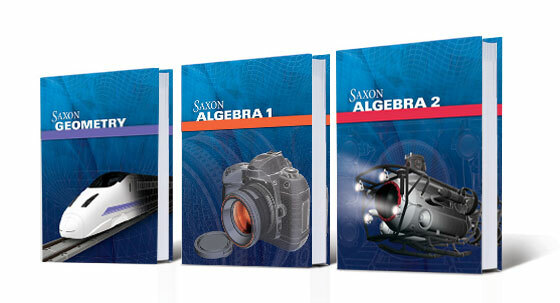 However, I would like to try out this series: more algebra, a separate geometry, just like I was requesting.